Sink the Stink® is packaged in convenient, sturdy, pre-measured plastic Turtle Paks® perdfect for travelling, 4 oz. bottles each containg 8 applications, and 1/2 gallon F-Style bottles specifically for our outfitters, maine parks and commercial users. Sink the Stink® is ready to use. Dispense 1/2 oz. from the 4 oz. bottle, or twist open a 1/2 oz. (15ml) Turtle Pak and squeeze the contents into 10 to 20 gallons of warm water (A quarter to half filled bath tub). Mix thoroughly. Immerse wet suits, booties, skins, BCDs and other gear in Sink the Stink®, making sure that all surfaces are thoroughly saturated. Most odors will disappear immediately! Soak for 5 to 10 minutes while agitating the equipment occasionally. An overnight soak will take care of really tough odors and stains. When ready, simply drain and hang the items to dry. Do not rinse again in fresh water. The biological odor reducing activity will continue until the material is completely dry. Traveling? Items may be packed wet or damp and will arrive odor free! 10-20 gallons of working solution will treat 10 or more sets of dive gear including wetsuits, BCs, etc. Discard the solution when the water becomes noticeably dirty, after final use, or within 24 hours of mixing. Commercial users will find our new Super Concentrate ideal for treating large numbers of rental gear or for dock side dip tanks. 1/2 oz. to 1 oz. (15ml to 30ml) is all that is required for a full days application and as many wet suits as required. 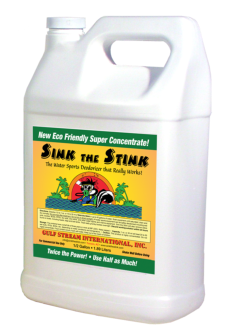 Sink the Stink® is a very cost effective way to preserve your investment in neoprene while keeping your customers happy with odor free rental gear. Do not dry in direct sunlight, unless temperatures are cold and do not use any harsh chemicals, bleaches or disinfectants which will diminish our bioactivity and reduce the life of your wet suits.